I'm not a violent man. As someone who has almost always been the largest person in the room, I know I have to keep my anger in check lest I ground someone into paste. I have that ability, I just know I can't use it. That said, there were at least 1,000 people in a room with me last night on the verge of being ground into paste. Look, I know NHL hockey is a relatively new experience for Nashville, much less the high level of play the Preds have engaged in this season. And as a strong proponent of the First Amendment and freedom of expression in general, far be it from me to impinge upon your cheering for a team you've been a fan of for an extended period of time. But as the game slipped away from the Preds (again) last night, final 4-2, the obnoxiousness of the Red Wings fans in attendance grew, right alongside the ability for my blood to boil. Dances with Monkeys was prescient early in the first period when she leaned over and said, "Maybe it's not such a good idea that we're here tonight...when they start scoring, you're gonna get pissed." And she was right, because when Detroit notched it's first goal, a larger-than-I'm-comfortable-with portion of the crowd cheered. 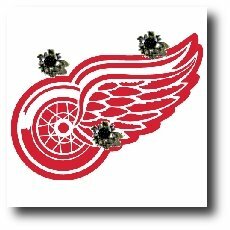 They continued when the Wings tied the game at 2-2 near the end of the first, throughout the scoreless second, and were unbearable when Detroit took the lead for good in the third. Again, I don't have any problem with people rooting for the team they love. But seeing that much Red in the home of the Preds just made me angry, and yet thankful no liquored-up frat boy Wings fan got in my face. For I'd be writing this blog entry from jail.